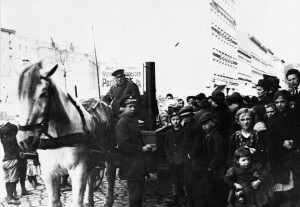 In August 1916 a group of soldiers’ wives wrote to the Hamburg Senate demanding its support for a peace settlement: ‘we want to have our husbands and sons back from the war and we don’t want to starve any more’.1 The government’s failure to ensure adequate food supplies and their equitable distribution, particularly to poorer people living in Germany’s towns and cities, impacted upon popular opinion towards the government and also the population’s support for the war. The government, claiming that Germany had enough food to survive the blockade provided people reduced consumption, had to try and lower consumption and, at the same time, ensure that there was an equitable distribution of food at affordable prices at a time when priority was given to providing food for the army. Food provisioning on the home front was the responsibility of the local authorities. Across Germany individual towns and cities had traditional food supply chains, with some securing their provisions from the surrounding district and others, such as the Ruhr, dependent on supplies from further afield in Germany and abroad. This was to be significant as food shortages grew and transportation was affected by military demands, and, in the winter of 1916/17, by the weather. At the start of the war there was a rush to buy staple foods to hoard, leading to price rises, and so the government allowed local authorities to introduce a system of price ceilings, which varied from place to place, not just in the maximum prices set but also the foodstuffs affected. Farmers, who resented interference in the free market, took their produce to places with higher or no price ceilings, or used it for animal fodder. This led in early 1915 to the slaughter of about one-third of Germany’s pigs, seen as competitors for scarce food resources, impacting on later meat and fertiliser supplies. From October 1914 to eke out grain supplies bakers were allowed to use potato flour in the making of bread, the so-called K-Brot (K for Kartoffeln (potatoes) or, more patriotically, Krieg (war)), but continuing shortages led to the rationing of bread from January 1915. Throughout the war, other additives such as corn, lentils and even sawdust were used to eke out bread. Food was more readily available in the countryside, and urban consumers came to believe that rural producers were profitting from their suffering. If the urban poor had relatives in the countryside they could obtain food from them, or they could ‘hamster’ – travel into the countryside and barter, buy or steal from rural producers, though they ran the risk of having the food confiscated by inspectors at railway stations on their return. On one day in June 1917 inspectors at a small West German town confiscated ’36 pounds of butter, 421 eggs, 5 hundredweight of flour, nearly 30 pounds of peas, 42 pounds of veal and 12 pounds of ham’.9 But the authorities were complicit – the railways put on extra trains to cater for the hamsterers, who were aggrieved that black marketeers and war profiteers could go about their business with impunity. Children of Berlin being fed with midday soup from a mobile field kitchen. Taken during the First World War by an official German government photographer. In 1916, with food prices having doubled since the start of the war, the government ordered all towns with over 10,000 inhabitants to expand their provision of soup kitchens, to ensure that people had access to one warm meal a day. By October 1916 some 357 towns had 1,438 kitchens, by February 1917 472 towns had 2,207 soup kitchens.10 Use of the kitchens depended on the amount of foodstuffs available in the shops, and the spring of 1917, following the failure of the potato harvest in 1916 and the difficulties caused by the harsh winter in the transportation and storage of food, saw an increase in demand. In Hamburg, where the use of soup kitchens was high, some six million portions were served in April 1917 and over a year later some 20% of the population continued to eat a meal from a soup kitchen.11 From late 1916 customers had to exchange their weekly meat and potato ration cards in order to get a week’s ticket for a soup kitchen meal, and they also paid a small sum. Those who could tried producing food for themselves – on balconies, keeping goats, rabbits and hens. Towns, too, turned parks into fruit and vegetable plots to feed the people. In Stuttgart authorities bought 740 acres of land to keep pigs fed by recycled kitchen waste. Once sold the money was used to feed 7,500 schoolchildren.12 But the opportunities for the urban poor to produce food for themselves were limited, and so they were reduced to hamstering, and, as the war went on, looting or stealing. The numbers of women convicted of crimes against property doubled between 1913 and 1917, and there was a growth in youth crime, as they, too, stole. The armistice in November 1918 did not bring much easing in the food crisis. It was to be July 1919 before the blockade was lifted and disturbances over food continued throughout 1919. Some price controls and rationing of various foodstuffs remained in place until 1922. 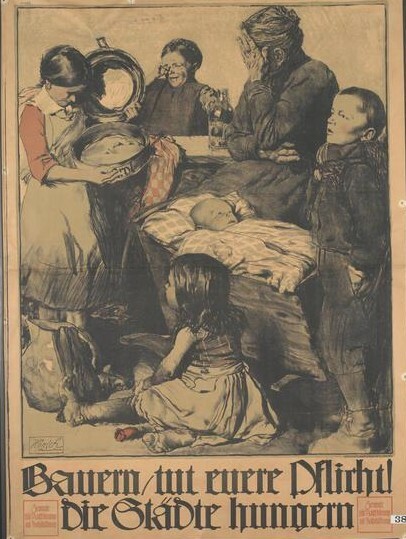 In June 1921 a million children a day were fed in the 2,271 food kitchens run by the Quakers in 1,640 German communities.16 The Nazis were to learn the lessons of the government’s inadequacies in maintaining adequate food supplies on the home front during the First World War and tried to ensure that racially valuable Germans had sufficient to eat during the Second World War. Plant oil! 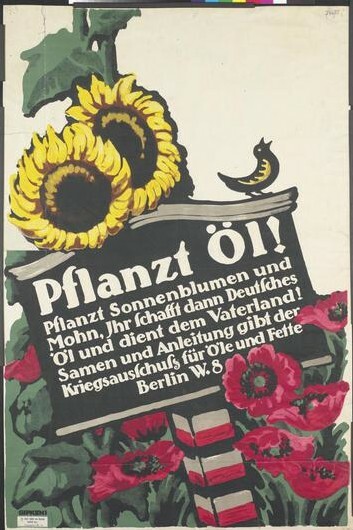 Plant sunflowers and poppies, thus producing German oil and serving the fatherland! 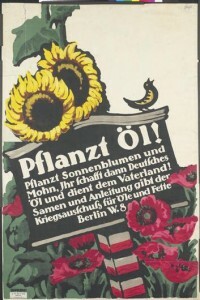 Seeds and instructions from the War Committee for Oils and Fats, Berlin W.8. 1 Quoted in Ute Daniel, ‘Der Krieg der Frauen 1914-1918: Zur Innenansicht des Ersten Weltkriegs in Deutschland’, in Gerhard Hirschfeld, Gerd Krumeich, Irina Renz (eds), ‘Keiner fühlt sich hier mehr als Mensch…’. Erlebnis und Wirkung des Ersten Weltkriegs (Essen: 1993), p. 131. 2 David Welch, Germany and Propaganda in World War I. Pacifism, Mobilization and Total War (London, 2000), p.128. 3 Toni Sender, The Autobiography of a German Rebel (London, 1940), p.81. 4 Quoted in Belinda Davis, Home Fires Burning. Food, Politics, and Everyday Life in World War I Berlin (Chapel Hill, 2000), p. 197. 5 Evelyn, Princess Blücher, An English Wife in Berlin (New York, 1920), p. 158. 6 Welch, Germany and Propaganda in World War I, p. 165; Roger Chickering, Imperial Germany and the Great War, 1914-1918 (Cambridge 3rd ed., 2014), p. 165. 7 Blücher, An English Wife in Berlin, p. 122. 8 Decie Denholm (ed. ), Behind the Lines. One Woman’s War 1914-1918 (London, 1982), p. 165, letter of 5 November 1916. 9 Ute Daniel, ‘The Politics of Rationing versus the Politics of Subsistence: Working-Class Women in Germany, 1914-1918’, in Roger Fletcher (ed. ), Bernstein to Brandt. A Short History of German Social Democracy (London, 1987), p. 92. 10 Christoph Regulski, Klippfisch und Steckrüben. Die Lebensmittelversorgung der Einwohner Franfurt am Mains im Ersten Weltkrieg 1914-1918 (Frankfurt am Main, 2012), p. 179. 12 Keith Allen, ‘Sharing Scarcity: Bread Rationing and the First World War in Berlin, 1914-1923’, Journal of Social History, 32:2 (1998), pp.371-93, here p. 377. 13 Regulski, Klippfisch und Steckrüben, pp. 319-20. 14 Elizabeth Tobin, ‘War and the Working Class: The Case of Düsseldorf 1914-1918’, Central European History, 13:3/4 (1985), pp. 257-98, here p. 292. 15 Chickering, Imperial Germany and the Great War, p. 144. 16 http://www.quakersintheworld.org/quakers-in-action/302, accessed 13 March 2015. Elizabeth Tobin, ‘War and the Working Class: The Case of Düsseldorf 1914-1918’, Central European History, 13:3/4 (1985), pp. 257-98.